With finals just around the corner, the baseball team is closing out their season. Coach Toby Gardenhire, a former Triple A player with the Minnesota Twins organization, will be finishing his third year coaching here at University of Wisconsin–Stout. When I interviewed him at the beginning of the season, he expressed great hopes for the team. The Blue Devils have continued to play well throughout the season and will be playing in the WIAC tournament next week as the no. 4 seed. Many of the Blue Devils received honors over the course of the season. 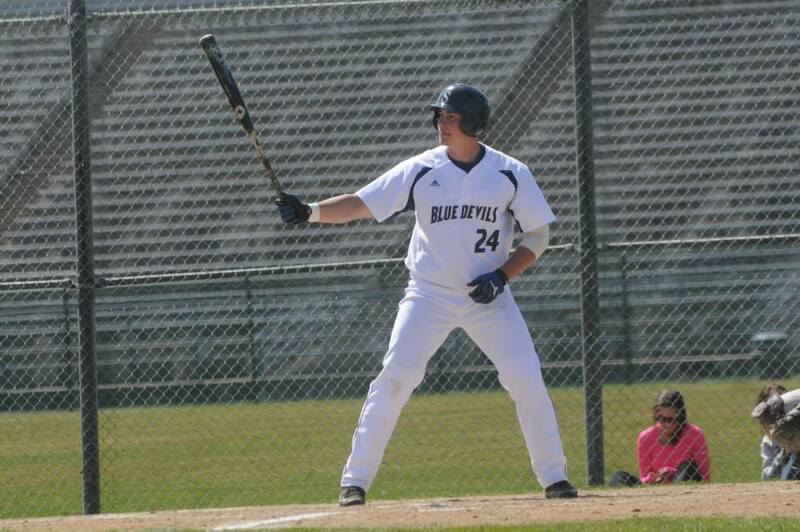 Jake Lunow, a junior from Princeton Wis., was the WIAC athlete of the week for April 22, batting .500 when the Blue Devils faced University of Wisconsin–Oshkosh and took the series 3-1. Patrick Gullickson, a sophomore from Chanhassen, Minn., was chosen as the Northwestern Mutual Athlete of the Week on April 23, following the UW–Oshkosh series during which he pitched a complete game in a 6-2 win. Ryan Freitag, a junior from Osseo Wis., and WEAU TV athlete of the week, powered the Blue Devils this season. With three homers in the the final series of the regular season against UW-Stevens Point, Freitag has 15 home runs on the season, tying the UW-Stout single-season record. Charlie Meyer, a junior from Janesville Wis., was selected to Capital One All District 6 baseball team because of his 3.56 GPA and his baseball record as a team captain, hitting .333 with 29 RBI, nine doubles, two triples and four home runs. Several of the players were interviewed to recap the season and the accomplishments they made individually and as a team. Players interviewed include freshman Nick Nalbach from Plover Wis., seniors Ian Schlitz from Franklin Wis., and Charlie Pelzer from Little Canada, Minn. and junior Jack Schneider from Minneapolis, Minn. Schneider tied the school record for doubles in a single season when he hit his 16th of the year against UW–Stevens Point on May 4. Here are some of the highlights from their interviews. Kylie Bowman: How do you feel about the way you have been playing as a team and as an individual this season? Jack Schneider: I am very happy with how we have played this year. We are definitely turning the program in the right direction. If I am doing anything to help my team win—such as getting hits or RBIs, making plays or cheering—then I am happy as an individual player. Nick Nalbach: This year I thought we played really well together. We worked really hard from fall to spring, knowing what had to be done to be successful, and I’m proud of where we’re at so far. Individually, we all have our ups and downs, but the nice thing about baseball is that one person can’t make or break the team. If one person struggles, there’s a whole team there to pick him up. KB: What was the strongest aspect of your team this season? Ian Schlitz: There hasn’t been any one part of our team that has stood out. Our pitching, hitting and defense have continued to be solid throughout the season. One thing that I would say has stood out is how we bounce back from losses. We have been able to control the damage when we do lose a game to come back and win the next one. Charlie Pelzer: I think one of the highlights of our team this year was our depth on the mound and in the field. We have a great starting nine, but if one of the starters isn’t playing well, there is all the confidence in the players behind him. KB: What are you expecting in conference play? NN:The WIAC is one of the best DIII conferences in the nation, and we knew going in that we would be playing some very good teams. We just came in with the intent to play the way we know how and keep pushing to be one of the better teams in the conference to make the playoffs. CP: This season we are all a family with one goal in mind. There is nothing more that we want to do than win each inning of every game. We have a very well-rounded and experienced team that can hit the ball throughout the lineup, so I expect us to be above .500 in conference. JS:Going to the WIAC playoffs and making a run to the top! The Blue Devils closed out their regular season with losses to University of Wisconsin–Stevens Point on May 3 to 4.The WIAC tournament will take place the weekend of Friday, May 9 through Sunday, May 11. Congratulations on a good season, and best of luck in the playoffs Blue Devils!